The artist's and clinician's craft begins with the eye. 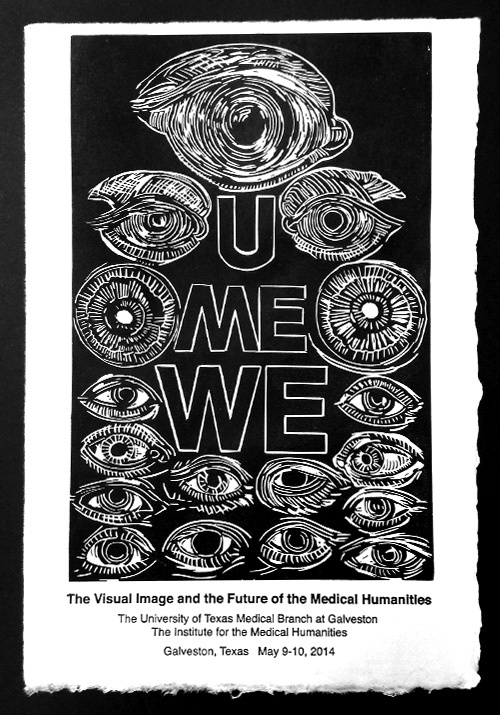 For The Visual Image and the Future of the Medical Humanities conference, I wanted to make a print that begins with the eye and ends with the practice of the medical humanities. 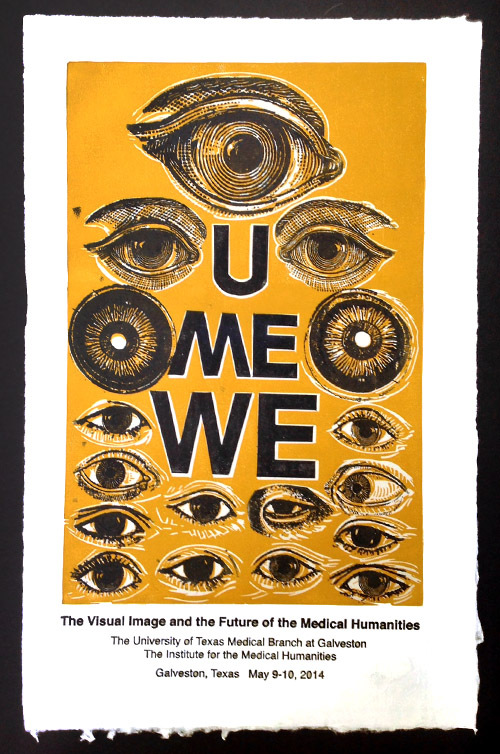 To read line one in this print, like reading a Snellen chart in the doctor's office, the brain turns the eye image into a word "I", in the context of U Me We. This simple flip involves a vast neural network that moves the image from retina through the brain to the occipital cortex where it is interpreted. While the back of the brain is processing the visual information, the frontal brain is searching memory for what these images and words might mean. How this all works, has been the subject of research and controversy in philosophy, psychology, cognitive science and neuroscience. At the IMH in Galveston, the medical humanities are practiced in a reflective way, moving beyond the self, the patient, the ethical dilemma, into the larger context of human values which are embedded in a historical, cultural and medical context. I tried to represent this reflective practice in this print. 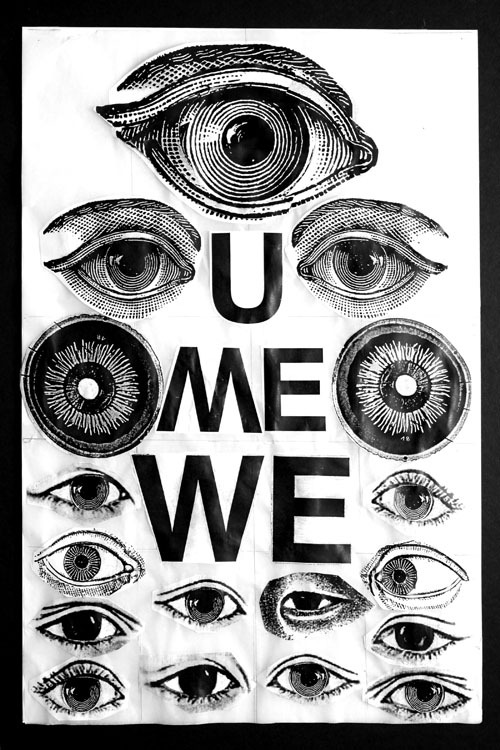 "I" look at your two eyes "U", while my eyes "ME", look back out through the pupil to the many "WE". 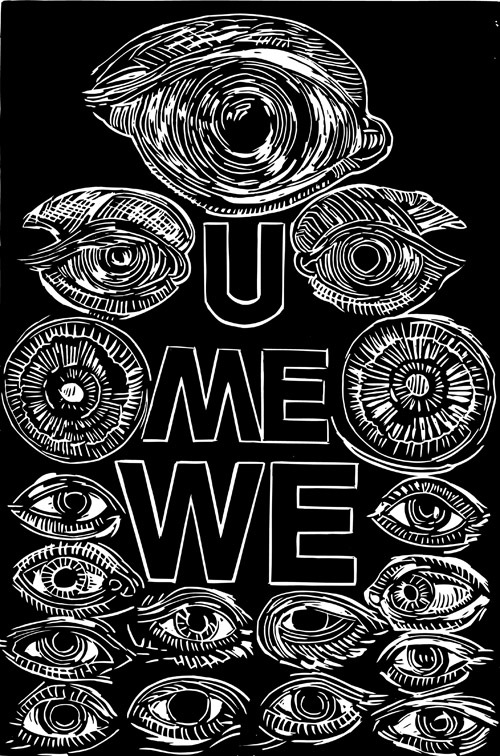 The clinical encounter often follows this reflective form - I U ME WE.